Leading Manufacturer of oil expeller mohit-150, oil expeller machine mohit-625, oil expeller machine mohit-250, oil expeller machines - mohit 100, oil expeller machine mohit-450 and oil expeller machine mohit-390 from Ludhiana. Cast iron bodies and gear box. Single reduction gear box with helical gears. Fabricated chamber of size: 27″ long x 4 ½” Inner diameter. Case hardened / Tempered worm assembly.EN-8 Main Worm Shaft and Driving Shaft.Superior quality of oil & cake.Maintenance is less & easy. 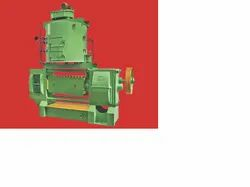 Power consumption: 3-phase 10 hp motor – 960 RPM.Feeding drum: single stage with & without steam heating arrangement (as required). 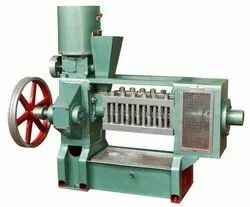 This machine is used for extracting oil from raw materials. 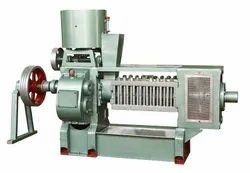 It is designed to ensure modern oil milling & maximum percentage of extraction from different varieties of oil seeds. Our expellers (Oil Production Machinery) are precision-engineered and are made of high grade raw material. Double reduction Gear Box of Cast Iron Bodies and Mild Steel Fabricated Gears, Base & Chamber. Case Hardened / Tempered Worm Assembly, Cage Bars and Cone Point. Chamber is made from Mild Steel Plates & Frame bars size ø 8″ x -ø 7″ x 44″ Long. Kettle: Two / Three High 48″ Diameter for Efficient Cooking of Seed, Pipe Fitting Contains all the required accessories or Long Steam Kettle 12 Feet Long also available. We are offering to our clients Fabricated Oil Expeller which is suitable for crushing all types of oil seeds whether edible or non-edible. Cast iron bodies & Gear Box. Steel fabricated chamber and Gears. Fabricated chamber of size: 30″ long x 5 & 5 ½” Inner diameter. Single / Double reduction gear box with steel casted. EN-8 Main Worm Shaft and Driving Shaft. 20 H. P. For Expeller. Case hardened / Tempered worm assembly and Cage bars. 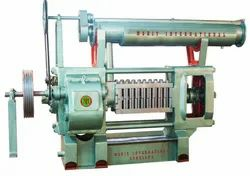 Capacity: 220 – 250 kgs per hour. Warranty One year warranty against any manufacturing defect. 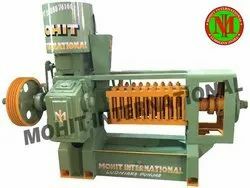 We are offering to our clients Oil Seeds Expeller (Mohit 100 ) which is suitable for crushing all types of oil seeds whether edible or non-edible. Fabricated chamber of size: 24″ long x 4″ Inner diameter. Case hardened / Tempered worm assembly. Case hardened / Tempered Worm Assembly, Cage Bars & Cone Point. EN-8 Main Shaft and Driving Shaft. Chamber is assembled from plate and frames of size 36″x 6 ½″. Steam Kettle: 8 Feet Long with steam jacket for efficient cooking of seed. Pipe fitting contains all the required accessories. Chamber is assembled MS plate and frame bars of size 33″x 6″.